Monolith combines pedal steel, piano, and string trio in a uniquely Texan approach to ambient modern classical music. 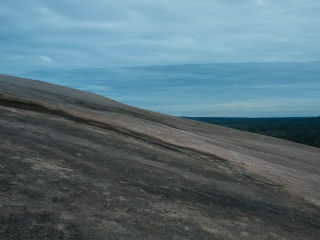 The performance features a projected photographic essay of Enchanted Rock by Leon Alesi and a presentation by geologist Rebecca Smyth. Composer Justin Sherburn has recorded interviews with Austinites about their experiences at the site, and these audio recordings are woven into the compositions. Performing with Sherburn will be Leigh Mahoney and Sara Nelson (Tosca String Quartet), Leah Nelson (Austin Symphony), and Brian Cassidy (Okkervil River). Inspired by the massive granite dome that rises above Central Texas, Sherburn began writing music in early 2015 that reflected the mystery and grandeur of Enchanted Rock. Legends of the site abound. Native American myths, tales of the Texas Rangers epic gun battles, and even stories from Austinites today have been distilled into a musical journey accompanied by photographer Leon Alesi’s gorgeous abstracts of rock formations and gnarled oak trees. The compositions glide seamlessly from sculpted fields of sound to dynamic counterpoint to a podcast-like retelling of the Enchanted Rock mythologies.